PHILADELPHIA—Delivering a historic and uplifting speech to the Democratic National Convention Thursday night, presidential nominee Hillary Clinton told the American electorate that when she was a little girl, most special interest groups would never even consider donating enormous sums of money to a woman. “It’s hard to fathom now, but back when I was growing up in the 1950s, Wall Street banks, major law firms, and every other special interest out there wouldn’t let a woman through the door, let alone funnel inordinate sums of money into her campaign as a means to advance their agendas,” said Clinton, adding that she personally had to work twice as hard as her male colleagues for decades just to be deemed qualified as a viable political conduit for hundreds of millions of dollars controlled by wealthy corporations and narrowly focused institutions. “In those days, it never even occurred to lobbyists that a woman was capable of accepting a gigantic check from a powerful entity in exchange for favorable policies several months later. My, how times have changed. 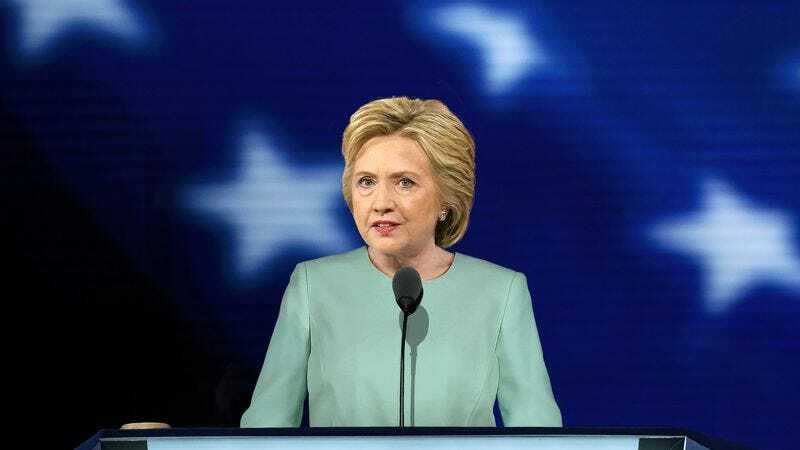 We sure proved them wrong, didn’t we?” Clinton then assured the cheering crowd at the Wells Fargo Center that while she might be the first female presidential nominee of a major political party beholden to well-heeled influence peddlers, she would certainly not be the last.